You will receive a Fei for Anthropologie Slub Side Panel Shirt in excellent pre-owned condition. Side and sleeve slub panels. Color: Orange. Machine wash and dry. Split neck. Gather detail at shoulder. You will receive a Tabitha for Anthropologie Loud & Clean Silk Halter Top in excellent pre-owned condition. Halter neck. Color: Navy Blue with Pink/Gold/White/Grey floral print. Neck tie length: 41". Standard wear from wash use. enlarge pics for examples and see definitions for details. These fees are non-negotiable. Extensions beyond 48 hours will not be approved. Top of Shoulder to Hem: 26". Length front/from shoulder to hem/ - . Wash care instructions: Machine wash. Waist/from side to side/ - . The fabric is stretchy. Anthropologie Embroidered Blouse by Namrata Joshipura Taupe size M. Condition is Pre-owned. Shipped with USPS First Class Package. Length from shoulder: 23". Gently used, no noticeable flaws. See pictures for details. Pretty peaches, blues and greens. No flaws, looks new. Anthropologie One September Floral Undergrowth Tank. It has a rounded hem and is longer in the back. When laid flat 24" long front. Pre-Owned but in great condition Anthropologie Maeve animal print short sleeve button down (only 3/4 of the way down) career/casual blouse. 100% Rayon. US Size 8. Anthropologie TINY Top. Gray With Red Embroidery. Button Down. Gently Preowned. Back Fabric Has Pilling, See Photos for Details. Sheer Fabric. Cloth Stone for Anthro. Button down front. 3/4 sleeves. Inside pocket. 100% tencel. The model pic is to show fit & style. 21” pit to pit 25-30” at longest length Condition: Pre-owned, in excellent condition. Anthropologie top in beautiful raspberry color. Fun stitching and fabric combos.There is ribbed knit and plain knit. Slight flair at the bottom. Sleeve ends have raw fabric finish that is stitched. Condition is New with tags. SUPER CUTE Floral Peplum Top Size Medium. Pretty multicolor floral design on cream background. Made from a cotton/poly knit fabric that’s very comfortable. Ties in the back. Measurements: Bust: 32” with stretch (fits a 34” bust very comfortably) Waist: 31” Length: 24” Shipped with USPS First Class Package. This shirt is in excellent condition with no visible stains or defects. Normal fabric pilling from being worn and washed. Pit to Pit (Across Chest ): 20.5". Sleeves (Top of Shoulder to Cuff ) N/A". Size: Small. This is a fabulous blouse that is navy blue in color with a turtle pattern, scalloped edge, v-neck, sleeveless, poly, size 8. Doesn't fit?. Don't like it?. No problem. Anthropologie SNAK silk crop Boho top with half sleeves, embroidered trim, crochet lace trim and button down front. Excellent Used Condition. MATERIAL: 100% silk, (crochet lace & contrast sleeve cuff is 100% cotton). LOT 2 Anthropolgie Womens Tops Small S Floral Purple. Condition is Pre-owned. Shipped with USPS First Class Package. Material : Linen. Care : Hand Wash.
Aviatrix tee by Pilcro. Pullover styling. Short sleeves. Body - 100% Modal. Trim - 100% rayon. No known flaws. Anthropologie Top. Condition is EUC. No rips or stains. Freshly dry cleaned. Shipped with USPS First Class Package. This is a Lovely EUC Cloth & Stone Top Size XS. The top is a super soft and lightweight rayon material. It is blue and white gingham printed pattern. Why not be super cute and comfortable. Great price?. EUC Anthropologie (Odille) sleeveless silk peplum blouse in size 4. Colorful confetti print on navy background with poppy red trim and buttons. Measurements lying flat are about: 17” armpit to armpit; 22” shoulder to hem. Rarely worn! New Anthropologie Eloise Seamless Reversible Tank Top Cami Womens S Light Grey**. Shipped with USPS First Class Package. MINE By Anthropology Sheer Teal Shirt Blouse Buttondown high low Top Size Small . Condition is Pre-owned. Shipped with USPS First Class Package. Button up sleeves with strap and 2 breast pockets. This shirt is higher in front and lower in back. NOTE ** There is a little bit of snagging going on on the right pocket. See the last picture for visual. 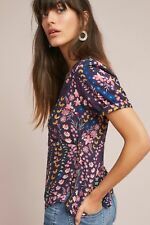 Women's Anthropologie French Connection Top Short Sleeve Top Size S (EUC).... Condition is Pre-owned. Shipped with USPS First Class Package. Anyone who is not happy with their items please contact me before leaving feedback. I do combine shipping. Maeve for Anthro. Adorable plaid peplum top has high low hem. 3/4 sleeves. Keyhole opening in back. Cotton, rayon. 🦋 approx. 20.5” pit to pit 🦋 approx. 24” length 🦋 Condition: Pre-owned, in excellent condition. Paper Crane Navy Blue and White Sleeveless Blouse. Large keyhole back. Navy blue body with white lace accent around the collar and back. 100% Polyester. Loose and flowing top. Armpit to bottom waist hem: 15". Anthropologie T.la Purple Shirt Size Small. Condition is Pre-owned. Shipped with USPS First Class Package. Great condition! See pics for details. The blouse is light weight and has embroidery with eyelet sleeves. The size of the blouse is 8. Anthropologie T.la Grey Shirt Size Small. Condition is Pre-owned. Shipped with USPS First Class Package. Women's relaxed top with button front detail from Anthropologie.